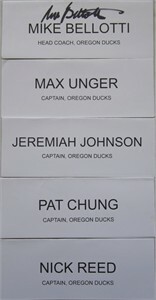 Original set of 5 Oregon Ducks head table placards from the 2008 Holiday Bowl luncheon in San Diego on Dec. 29, 2008: head coach Mike Bellotti (autographed nicely in black marker) and team captains Patrick Chung, Jeremiah Johnson, Nick Reed and Max Unger. Double sided, about 4 by 11 inches when displayed. 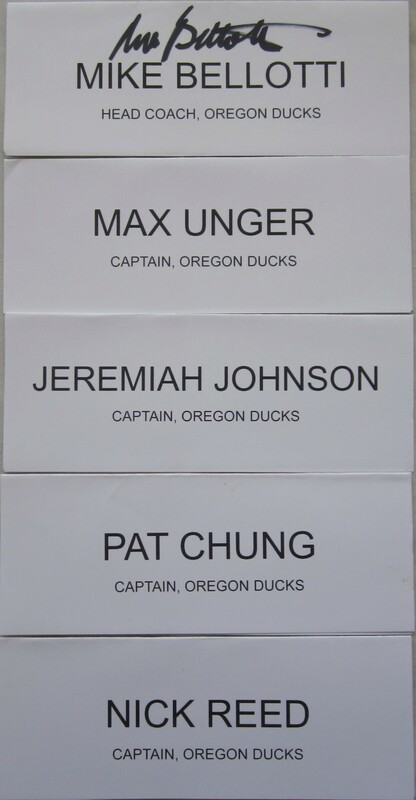 The Johnson, Reed and Unger placards have their positions written in the upper left corner on one side. The 2008 Oregon Ducks won the Holiday Bowl over Oklahoma State 42-31, and this turned out to be Bellotti's final game of his coaching career. With certificate of authenticity from AutographsForSale.com. ONLY ONE SET AVAILABLE FOR SALE.